This blogs talks on the steps of how to use Cyberduck utility with Spectrum Scale for object which allows easy access of object from all supported platform of Cyberduck. Since spectrum Scale for object is based on Openstack swift the steps below should be applicable for Openstack SWIFT as well. – IBM Spectrum Scale with Object enabled and configured with any authentication scheme(Local, AD, LDAP). Listing Object Authentication on IBM Spectrum Scale. Additionnal steps(adding v2.0 endpoints) are only required for IBM Spectrum Scale 4.1.1. During Object configuration following service endpoint(Keystone v3 api, Object- store) are created by default. To configure the Cyberduck with IBM Spectrum Scale Object store one need to add Keystone v2.0 api endpoint with valid region. By default all the endpoing in the IBM Spectrum Scale are created with ‘None‘ region. Along with Keystone v2.0 api endpoint, one need to set proper region in the Object-store endpoints also. The region in object-store endpoint must match with the region specified in the keystone v2.0 endpoints. ie regionOne in this setup. The final endpoint list on the IBM Spectrum Scale will be similar to following one. 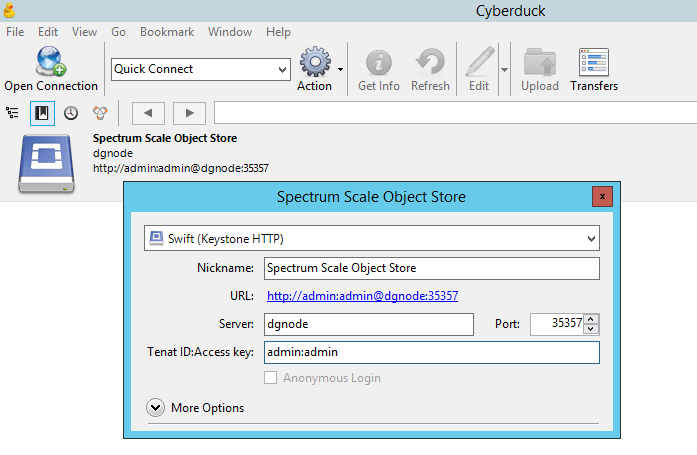 Now IBM Spectrum Scale Object Store is ready for using it with Cyberduck. Download Cyberduck profile for keystone v2.0 and Swift HTTP (insecure) from here. Content of sample Cyberduck profile used in this setup. 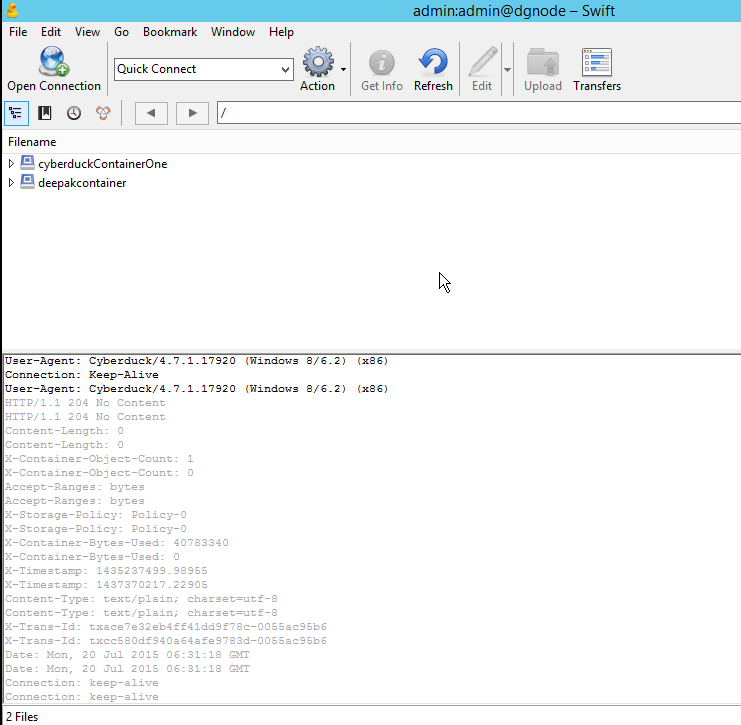 Connect to server(IBM Spectrum Scale Object Store) using the bookmark created in previous step. 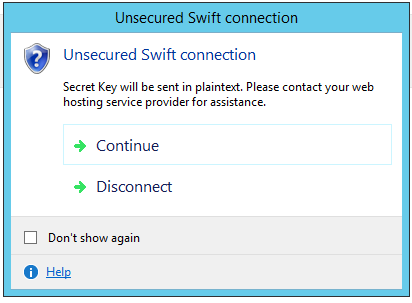 This setup is using swift/keystone over http (insecure) hence Cyberduck is giving the following warning. Cyberduck is now connected and listing the existing container(if any). One can create/list/delete container as well upload/download object using Cyberduck interface. Credit for putting all these steps together goes to Ariday and Vikram. I am just penning down them here.